When you drag the upper arm of the puppet armature, the lower arm and hand follows. When you drag the lower arm, the hand follows. Nothing follows the hand. The changes propagate forward. 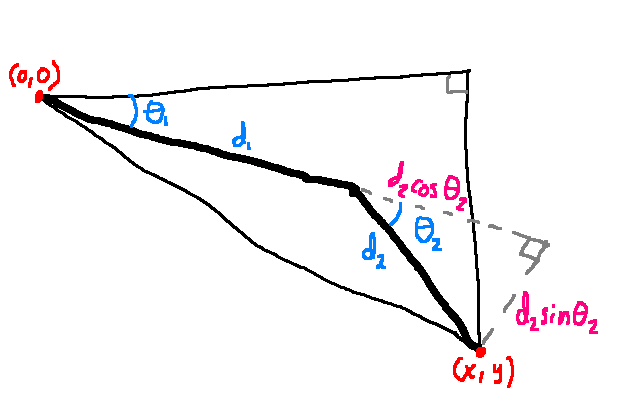 This is pretty simple to program: when drawing the descendents of one segment of the armature, you just keep adding to the previous coordinate space. If the upper arm is rotated 20 degrees, when you are going to draw the lower arm, you don't rotate it back - you just keep that rotation and add to it. In inverse kinematics, you drag the hand, and it bends the other joints accordingly to make everything line up. The transforms are propagated backwards from before, from the hand to the upper arm. This tends to be more natural for artists to work with so it's a worthwhile enhancement to add to an animation system. Programming it is a little harder though. This is doable for a length-2 chain of joints, but becomes really tedious for anything more than that (or if you add a third dimension, since 3D models need IK as well). Instead, we can come up with a numerical solution that, over a few iterations, approximates the result for arbitrarily many joints. I'm going to describe an algorithm called Cyclic Coordinate Descent. In code, the most difficult part of this is figuring out where to point a given joint. We know we want to get the angle between the start of the joint to the end of the chain, but we need to do a little work to get that when the child joints are defined relative to their parent. The key is to take the endpoint from the lowest-level joint, and then apply the transform of that joint when passing it up to the parent. As we pass the endpoint up, joint to joint, we keep adding on to its transformation. This works much the same way forward kinematics works, except we start from the lowest level and work up. When programming it, we usually don't have direct access to the lowest-level joint. Instead, higher-level joints have references to their children. With a setup like that, we just need to run the algorithm in post-order: before updating the current joint, tell the child to update. This way, we end up waiting for the most deeply nested joint to finish before working our way back up. You will want to run the updateIK function a few times. Each iteration should bring it closer to the desired result, eventually converging as the number of iterations goes to infinity. I've gone and made a demo in P5.js so you can see how the code works and play around with it. Feel free to check out the source code on CodePen. See the Pen IK Demo by Dave Pagurek (@davepvm) on CodePen.